AutoSum creates the formula for you, so that you don't have to do the typing. However, if you prefer typing the formula yourself, see the SUM function. Use the SUMIF function when you want to sum values with one condition. For example, when you need to add up the total sales of a certain product. 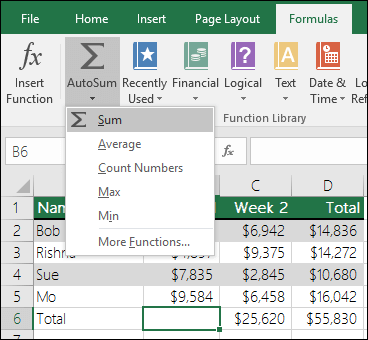 Use the SUMIFS function when you want to sum values with more than one condition. For instance, you might want to add up the total sales of a certain product, within a certain sales region. For an overview of how to add or subtract dates, see Add or subtract dates. For more complex date calculations, see Date and time functions. For an overview of how to add or subtract time, see Add or subtract time. For other time calculations, see Date and time functions.